Tokai Forum - a subsidiary of TokaiRegistry.com :: View topic - 1979/80 ST80? Cool, I would put money on it that it is a 1 piece. Yeah, that certainly looks like a one piece to me as well. Little update. Officially bought it today. It's still across the country, my buddy picked it up today. Hope to have it sometime this weekend, it has to travel back with a different friend. 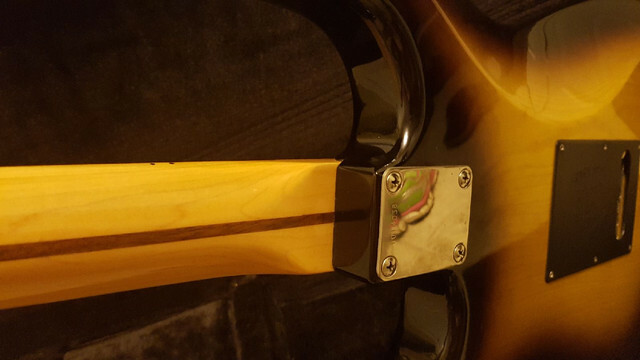 He's not a guitar guy but he sent me a few quick pics. Looks like it's an 81 according to the serial number. I looked it up and it's not in the registry yet. He said it looks like it's a 1 piece body. He said the guy was a cool dude, played in the Cooper Brothers. I'm not familiar with them but they're an old Canadian southern rock band. Thanks! Got lucky with this one! As I’m sure you know, old Tokai like this don’t show up in the Canadian used market very often. I think the price was VERY good too looking at the condition and how rare it might be as a 1 piece ST80. It's always nice to get lucky !!! I saw that one myself but it was in Ottawa and I already have all the strats i need. Glad it went to a fellow forum member. Tokai's are not common here outside of fakes and most people prefer the big names or have never heard of Tokai. 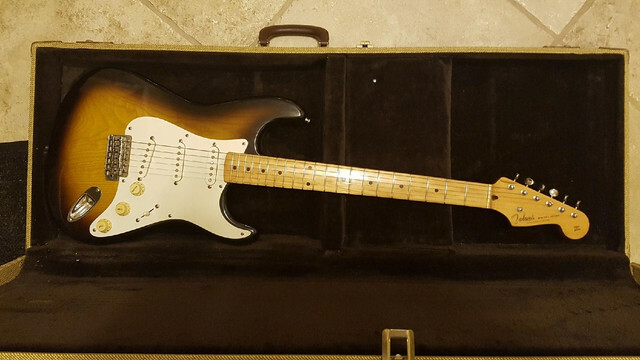 I love Tokai's golden sunburst, looks like a winner !! 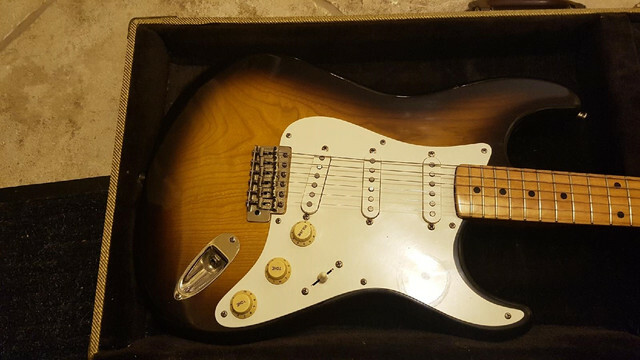 I already have all the strats I need too, actually just bought an '80 ST80 from spikeymikey on the forum here recently, but I randomly stumbled upon this one and after it checked out as being real I had to have it too. I'll probably move one of them on after this one gets here. 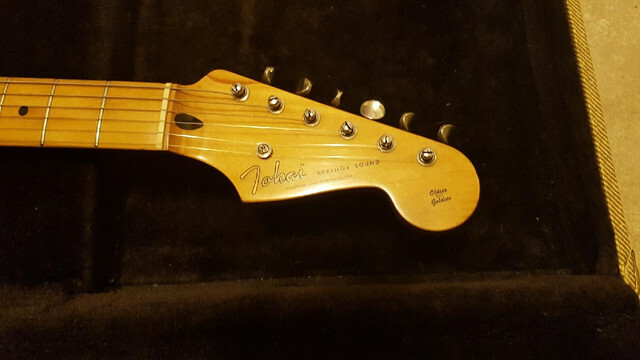 I'm out in BC, I don't see many fakes around for sale but also just don't see many tokai's in general. Got the guitar today! Definitely a cool one. I don't see any seem at all, looks like one piece for sure. A few minor little nicks but overall in really great condition. Average weight, if I had to guess I'd say around 7.5-8lbs, it's certainly not heavy. It has 9's on it right now, definitely want to string it up with 10's but I think it's a keeper! Hey Cam. Glad to hear,,, not the original case, I actually got it in the original gig bag which is somewhere around the premises?!?? Can get it to you someday. The guy I got it from was from the Philippines and traveled back and forth in the day to Japan. He later met at a shop there one of the original head masters that worked at the original plant and was somehow responsible in the production of this Tokai series. He had that guy sign the back guard I never went as far to investigate. I used to have a vintage store here in Ottawa for 15 years. Closed 9 yrs ago and am moving gear that has been stored way too long. Hence the release of your new guitar. Glad to see it go to a good home! If this an 1981 ( which the serial number and body stamp placing suggest then the electrics have been swapped out. The stamping of 'A' or 'B' on the scratchplate was discontinued in Early 1980 and as this looks very original, I can only suggest the change of electrics. Body looks 1 piece Sen. Check the neck base for a matching ' 6=9 A' stamp to be sure they are correct. As 1979 and 1981 Springys have a different sized neck plate, I don't believe it is a swapping of serial numbers. Check the neck base for a matching ' 6=9 A' stamp to be sure they are correct. I have a 1980 ST80 in my possession as well and the neck plates do seem slightly different dimensions. 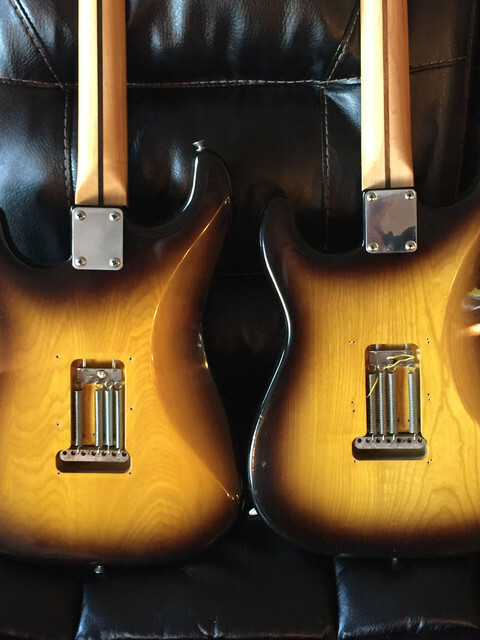 The guitar in question is on the right, the other on the left. 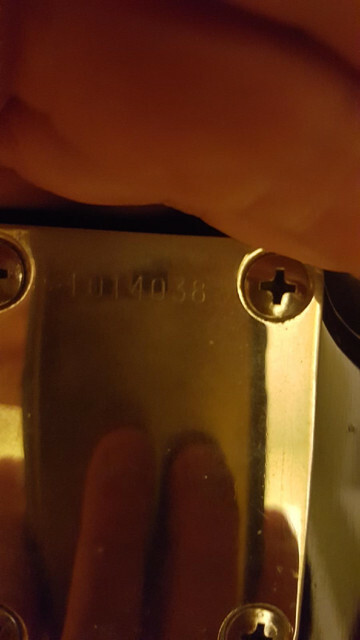 I didn't measure them and I'm not sure if this picture is close enough to really tell, but the 1980 plate seems slightly narrower, there's a little bit more space between the edge and the screws. The plate on the right, the top right corner of it ever so slightly hangs over the edge of the body/cutout, whereas the 1980 plate on the left doesn't. Not sure if this tells you anything else? I think it is an optical illusion, but the plates are the same size. I have measured them with vernier calipers. The screw spacing however is different. 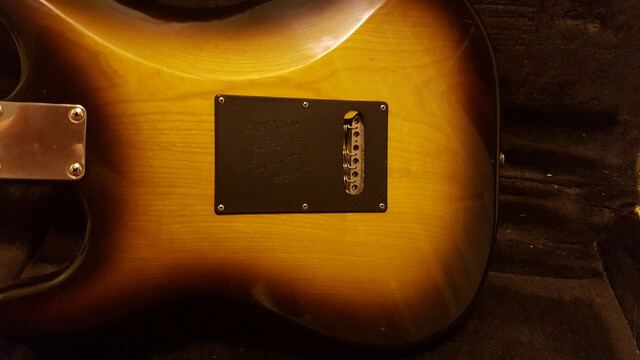 From 1981 onwards, Tokai employed a "Fender" spacing, prior to that the screws were spaced closer together. The screws themselves are also different diameters - the older ones being slightly thicker.